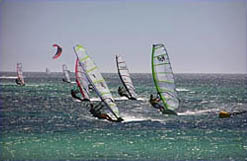 Island Holidays has been catering for windsurfers and surfers for over 15 years and more recently kite surfers. The following is an outline of a few of the destinations that we offer packages for windsurfing and kitesurfing holidays. There are some exciting and beautiful spots to visit and we will endeavour to give you information and advice to make your journey as pleasurable and hassle-free as possible. We have focussed on the most popular destinations in the Pacific islands, but do not hesitate to contact us with any other options. Basically - wherever you would like to go ... we can get you there! 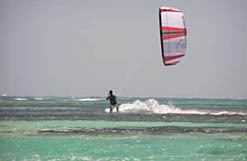 Recently there have been many more destinations opened up to wind and kite-surfers. Some of these being Java in Indonesia (great wave sailing) and Samoa (great lagoon sailing with consistent mid-year trades) in the Pacific. Any prices listed are a guide only - please contact us the latest costs. Each destination has various locations, wind patterns and trade wind peaks. In general, the most wind is in our winter months in Fiji, Rarotonga, Tahiti and Hawaii. Western Australia and New Caledonia are best in our summer months. Equipment hire and instruction is available in a few of the spots.